Last week Facebook announced plans to target advertising to all of its users by utilising information gained by your browsing history. Basically Facebook will act as intermediary and deliver the targeted ads from advertiser to user, but stressed that it won’t share an individual user’s web-browsing information with advertisers directly. This has sparked an interesting debate on how our browsing data is used, but there is a surprising number of websites already doing this anyway, how else do you think that shortly after booking flights to New York, it seems that every website you visit has adverts for New York Hotels. 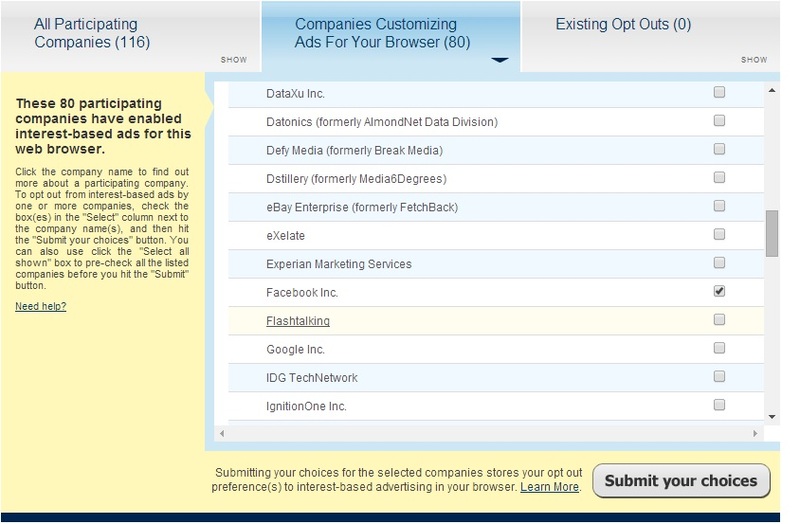 However the Digital Advertising Alliance has come to the rescue to prevent your browsing habits outside of Zuckerberg’s behemoth from being used to help deliver custom Facebook ads, this service will also raise a few raised eyebrows at just how many companies are utilising your browsing history. So if you would like to take a look at what’s under the hood of your browser, simply disable any pop up blockers you may have installed and follow these simple steps on how to stop Facebook from using your browsing history for targeted ads. Visit the Digital Advertising Allowance here and the scanning against your browser will begin. After a short wait, you should be greeted with a message saying “Opt Out Complete” and you can smile smugly safe in the knowledge that you just secured a tiny victory against Mark Zuckerberg and maybe even watch the scene from the movie “Social Network” that states Ads aren’t cool, Facebook is Cool. How times have changed and ironically, maybe this is the reason that Facebook is no longer cool. Facebook has just announced that it’s buying Oculus Rift for $2 billion, no you are not reading some clever political satire here, the Zuckerberg behemoth has struck again! Initial thoughts of a nightmarish future that feature the worlds population plugged into games like Farmville and Candy Crush Saga as targeted adverts are sent directly to your brain in rapid succession spring to mind but Facebook isn’t that creepy is it? I cannot help but feel a little suspicious of their motives, when they say that they want to promote a device for social purposes, anyone who has ever seen a photo of it Oculus Rift in action can see that you cannot get much more anti social than strapping a computer to your face. The full statement from Mark Zuckerberg states the following.